Tracklisting / Additional Info: This is a copy of the limited edition signed version of the book. 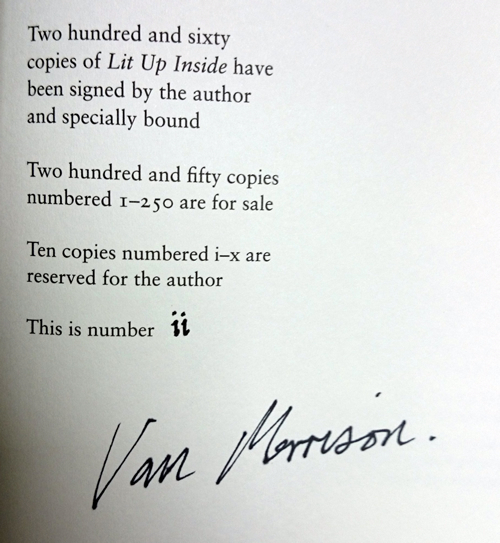 The book is Signed by Van Morrison on the limitation page, hand numbered with the special text 'Ten Copies Were Reserved For The Author. This is number ii'. The book is quarter bound in cloth and paper, with spine blocked in black pigment and gold foil. 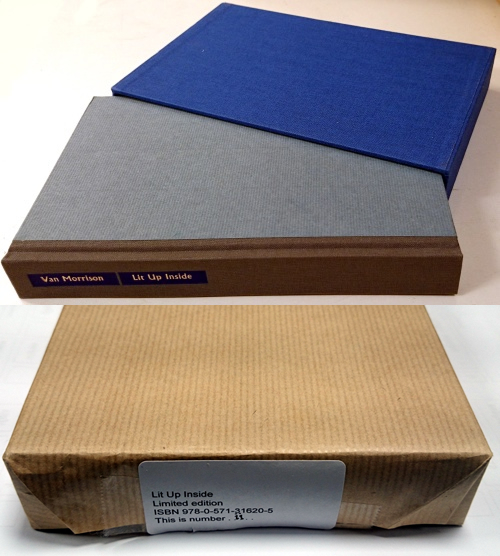 It comes with head and tail bands & coloured endpapers and is housed in a cloth-covered slipcase. This package is then wrapped in plain brown paper with an individually numbered title & ISBN numbered sticker. Unlike the deluxe edition, no cow had to be sacrificed to provide the cover so this is especially suitable for Vegans and also, unlike the deluxe edition, this is one of the ten copies that were reserved especially for Van Morrison himself !